US President Donald Trump’s executive order on immigration fundamentally alters decades of bipartisan US practice. It blocks immigration from seven predominantly Muslim countries, and stops all refugee resettlement for at least 120 days. … the US must ensure that those admitted to this country do not bear hostile attitudes toward it and its founding principles. The first element includes blocking any immigration from seven countries – Iran, Iraq, Libya, Somalia, Sudan, Syria and Yemen – for at least 30 days. The first day after the order was approved dual citizens and US permanent residents – usually called green card holders – were prevented from boarding flights to the US and even detained on arrival. A temporary injunction has provided at least some protections, though it is being applied patchily and only to those people who have already entered the US. The order also suspends all refugee admissions for a minimum of 120 days. After that the US will still admit only nationals of countries where the government has “procedures [that] are adequate to ensure the security and welfare of the US”. In a continuation of current congressional practice, the US will also prioritise refugee claims based on religious-based persecution, where the person is a member of a minority religion in their own country. And no Syrian refugees will be admitted until the US refugee admissions program aligns with the national interest. Finally, the US will limit the number of refugees it admits in 2017 to 50,000. So, what does this all mean for refugees? What does it mean for refugee acceptance? The UN Refugee Convention provides refugees with a strong set of rights. However, it applies only when a refugee is within a signatory country’s territory or jurisdiction. The convention does not oblige any signatory to accept other refugees. 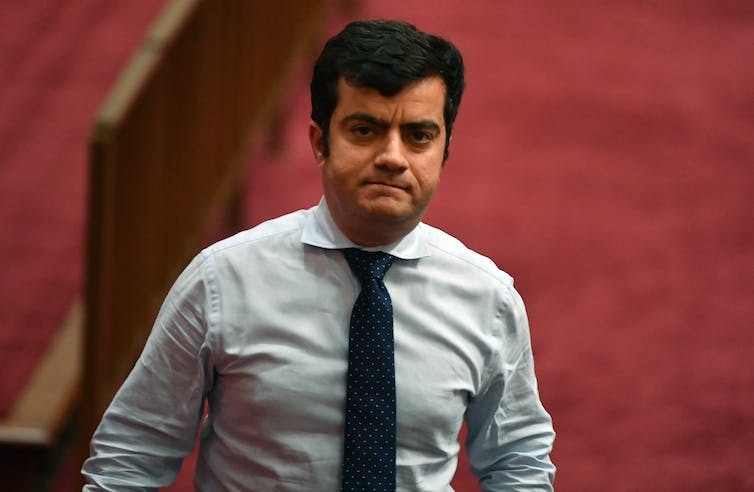 However, the UN High Commissioner for Refugees (UNHCR) considers resettlement to be one of three “durable solutions” for refugees, alongside voluntary repatriation and integration in a host community. These solutions enable refugees to live their lives in dignity and peace. … life, liberty, safety, health, or fundamental human rights are at risk in their country of refuge. Thus resettlement can be critical to provide refugees with protection. Resettlement also has important geostrategic implications. It helps, as several former US government officials have noted, support the stability of allies that are struggling to host large numbers of refugees. … the necessary, decisive battle against terrorism does not justify a general suspicion against people of a certain origin or a certain religion. The US resettlement program has long had strong bipartisan support. But it is also critical to global refugee resettlement. The US takes in by far the most resettled refugees of any country. Canada and Australia are a distant second and third. 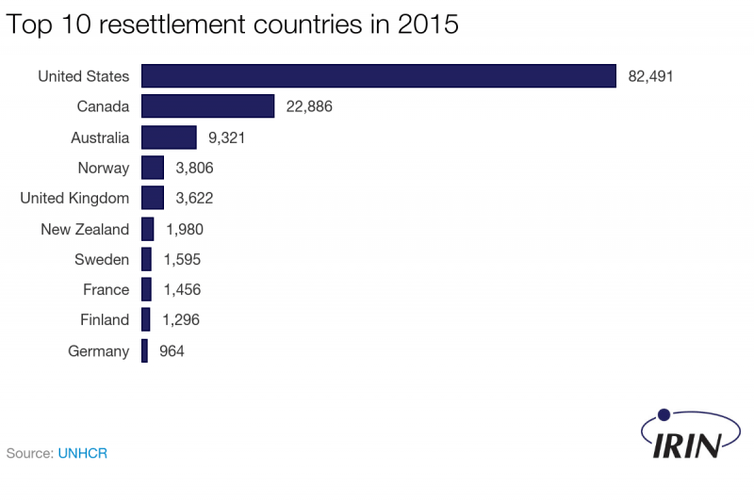 Top ten countries for refugee resettlement in 2015. The justification for the shutdown is to improve the US’s own security measures by introducing, as Trump has previously argued, “extreme vetting”. But this already exists for resettled refugees. As part of the Refugee Admissions Program, individual refugee cases are screened through a seven-step process, including security and background checks, personal interviews with agents from the US Department of Homeland Security, and other measures. This process can take up to two years. The chance of an American being murdered in a terrorist attack caused by a refugee is one in 3.64 billion per year. Only about a dozen – a tiny fraction of 1% of admitted refugees – have been arrested or removed from the US due to terrorism concerns that existed prior to their resettlement in the US. None of them were Syrian. Trump’s ban will also have two wider effects. It appears not to be affecting the November agreement between Australia’s prime minister, Malcolm Turnbull, and Trump’s predecessor, Barack Obama, to resettle refugees from Nauru and Manus Island in the US in exchange for Australia accepting a group of Central American refugees. Many of those on Nauru and Manus Island come from Iran, Iraq and Somalia. 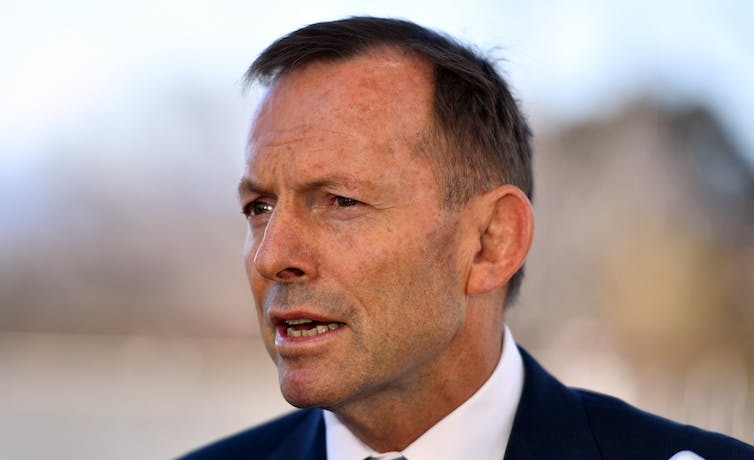 … will do everything in his power to put an immediate stop to this secret Australian-US refugee deal that should have simply never happened in the first place. But in a phone call between Trump and Turnbull on Sunday, Trump appears to have given assurances the deal would still go ahead. The order gives the power to the secretary of homeland security to continue to admit refugees for resettlement on a case-by-case basis, irrespective of the wider shutdown. Globally, the shutdown will have lasting and detrimental effects for refugees. In the Middle East, it may prove to be a boon to the Islamic State. The terrorist group has long sought to disrupt refugee movements. The ban will also put more pressure on refugee-hosting countries. About 90% of the world’s refugees are in the developing world. The international refugee system works through burden-sharing: host countries know that at least some refugees will be resettled and that they will receive financial assistance for the refugees from the UNHCR and other organisations and governments. Trump’s move challenges this directly, and will likely lead to further restrictions on the ability of refugees to receive basic protections.